What will Hilda Gurney think of Ri-Ri? It's time to ramp up for Devon and to prep for Riley's under saddle debut. The day sheets were posted about ten days ago -- they list the competitors in each class. How will Riley will compare with the other horses in the class? I couldn't resist a little sleuthing. Here are some videos/pix of the other horses who will be there. IMHO the most impressive ones are Borencio, Beaumont, and Rauber in that order. But in this cast of characters Riley should "fit in" pretty well. Last time Riley was at Devon (2007) he was a yearling in the Championship class. He scored 10th place out of 11 horses. Of course I think he was robbed ;-) but he was a pretty geeky yearling. No matter -- it was the most fun I've had at a horse show. 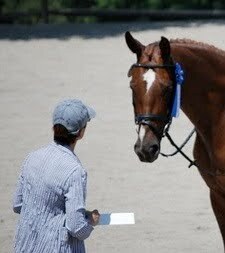 I really want to repeat that experience -- a great time, a beautiful horse to show off, and lots of good shopping. OH, BTW -- Hilda Gurney is the judge this year, and back in 2007 she gave Riley as 76%. The first two horses are nice, but I think Riley stands well with them. Of course, at this point, it's hard to tell how developed and steady they are to the bit and how much stronger they may be since the videos were taken. It may well come down to level of training if the gaits stay as close are they are now. Looks like a good class with Riley right up there with the best of the group. It's tough to judge based on one snapshot in time but I agree with your assessments. Good luck!